Pantha Scout Loop tail made approx 1977 , very rare to find today. made in a small country town in New Zealand. Super Maxy cranks, USA-Euro bb , Tange headset, I have new tange 1200 forks coming..Aero MX2 stem..The wheels are alloy called Honey-Combs..also made in new Zealand..Frame number is SC4779..I'm looking for a nice chrome or silver alloy bars and a black aero saddle ...I've listed as 1977 model due to thats about when they started. this bike with having twin front gussets would be around 1980. but headtube decal is much earlier.. I took the wheels in today to get paint stripped ,,back to plain cast alloy like the motomag's , which they are a copy of....has anyone got a brand new black hard skin bmx saddle they wanna sell??.. Update, I got the wheels back from the paint strippers and I'm gutted,,Rear wheel is mint but front wheel has been sandblasted in anther life..Sopose carnt moan no cracks in the wheels..I'll take them in next week for a quote on getting them Polished...front wheel is gonna cost a bomb..I've also picked up a old brand new pair of handle bars rear old school with about a 1/4 (dia) top cross bar.cross bar doesnt look welded in but sweated in using gas...They have four rows of Earlings to suit MX/ACSBMX type stems or 70's Mongoose..I'll get these paint stripped and chromed this week....Guys Chrome for the bars or Nickel?.. I really like the overseas bikes. Been getting an itch to find one. Hi a Pantha or a Healing HMX is like pure Kiwiana ...Just like the VW bettle of the world..
hmmm decal is one we had to give away at BMX races as a promotional sticker. Frames is SC early 81/ish and an early american one piece BB. (With new gussets.) Something we resisted as quality cro-mo one piece cranks were hard to get consistency in quality. We had in testing so called good brands ending up as 6.05 instead of opposed at 6.00 o'clock in jumps on our test track. We also introduced Cro-mo Tange forks about then and conventional stems. Also spoked wheels Araya/Sunshine. Copies of Motomags not likely Pantha wheels were the first in the world with freewheel, there was another heavier US mag with bendix back pedal brake just before ours plain spoked. All the other alloy wheels then followed Pantha's example with variation of spoke patterns. None had the quality sealed bearings which were also a first. We had enquiries from around ...the world even doing a sample for Suzuki. We just didn't have the production capacity. You may be onto something thier...I remember PANTHA Wheels from late 70's but never saw a motomag untill early 80's..
these wheels are sealed bearing but the old skateboard type with metal sides not plastic or rubber.But today these wheels have the good bearing and custom made axles to suit.. TRUE the pantha wheels are freewheel and the lester is a coaster. 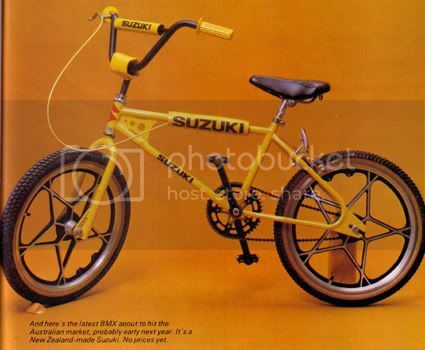 SUZUKI Made bloomin nice BMX's I had a Pro-Sight for a while..Carnt beat that Japanese Cr-Mo Ping of frame flex in a half pipe..
You would have liked the Suzuki wheels we made with more direct spokes. We also made several Suzuki bikes , but again we pulled the pin on them as we had problems keeping up with demand for Pantha, here and in Australia. West Coast Cycles wanted the pantha wheels especially our series 3 model stiffened and reduced in size with higher strength alloy. Bearings we used RSS as well as . WOW! Wait till Brit and Jermaine see this thread! They were made by the same group as all design /specs were a co-operation likea car manufacturer. Dixon Engineering were part of the team as they were already making car mags. The first wheels we made were painted and wet sprayed in gold. Later models we powder coated in colours as listed plus Silver and Black.We made axles and axle nuts modelled on campagnolo track wheel nuts. Yes they were a world first utilising quality Rss sealed single row bearings. We attempted to anodise the wheels but the alloy composition would not allow an acceptable finish. Handle bars were Box and same colours as wheels. The oval tubed forks were a first as well. The rims for spoked wheels were originally Araya 20x1.75 anodised and skinny rims were 20 x 1.13/8. W e also did some special builds with Araya20 " tubular rims and tubular tyreson a light weight Tange cro- mo tube set.